Around 1911 Baden-Powell asked Wyllie if he would initiate a Sea Scout troop, so the 1st Portsmouth Sea Scouts came into being. Wyllie allowed the scouts to use a room in Tower House as their headquarters. 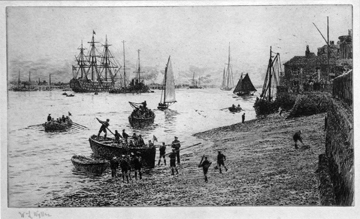 The etching above shows the Sea Scouts launching a gig from the small beach alongside Tower House where they kept their boats. 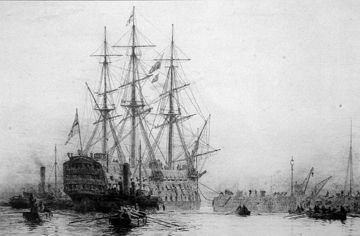 HMS Victory is in the distance and Quebec House is on the right. HMS Victory entering dry-dock on January 12th 1922. 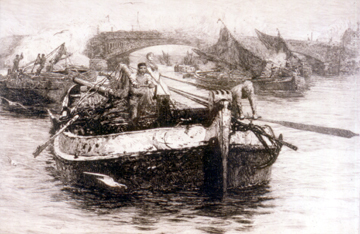 Wyllie campaigned for the old ships rescue and along with the Society for Nautical Research was able to save her for the nation. He painted his 42' x 12' Panorama of the Battle of Trafalgar to raise funds for Victory's restoration, with money from visitors entrance fees going towards that cause. 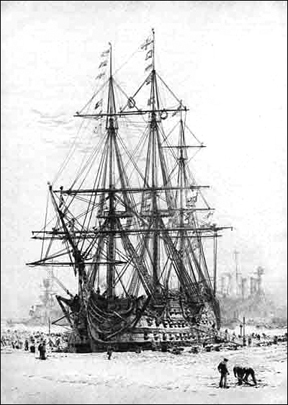 HMS Victory in dry-dock, Portsmouth. Yachts at the entrance to Portsmouth Harbour. Raising the mainmast after passing under a bridge.